On a recent trip to Japan we travelled around the country by train. I was sceptical at first but after just two days I began to appreciate the value of my Japan Rail (JR) Rail Pass and the freedom it gave me. Before travelling to Japan I had been advised we would be using the luggage forwarding service so I would need an overnight bag (hand luggage size). This was a great idea as we did not have to deal with large cases on the trains. The local trains were very crowded sometimes but I was able to reserve a seat for most of journeys. I did this at the Japan Rail office in the local station. 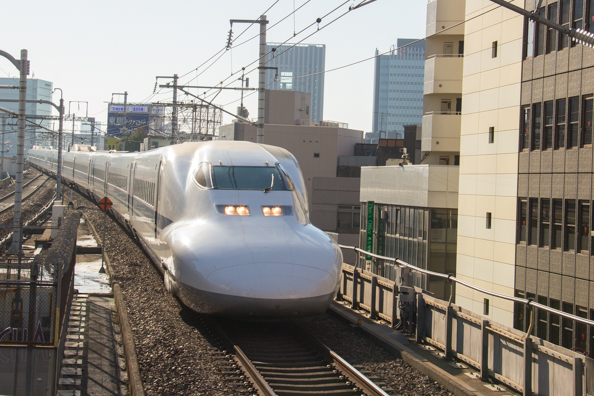 The JR Rail pass is valid on the Shinkansen or bullet train. Five companies run the Shinkansen but the JR Rail Pass is only valid on three of these companies. The pass is not valid on services run by Nozomi and Mizuho. If any part of a journey is taken on a train that is not covered by the JR Rail Pass then the whole journey has to be paid for. For every journey I made I studied the train timetable carefully to make sure I used the right train. My journey started in Minato, a suburb of Tokyo. I was transferred by bus from the airport to my hotel, Shiba Park Hotel, in the suburb of Minato. While I waited for my Rail Pass to be delivered I had time to explore Minato. I was delighted to discover that the Tokyo Tower was just around the corner. The tower was built in 1958 and modelled on the Eiffel Tower in Paris, France. Although it functions as a radio and television tower it is also a very popular tourist attraction affording good views of its surroundings from the two viewing platforms. 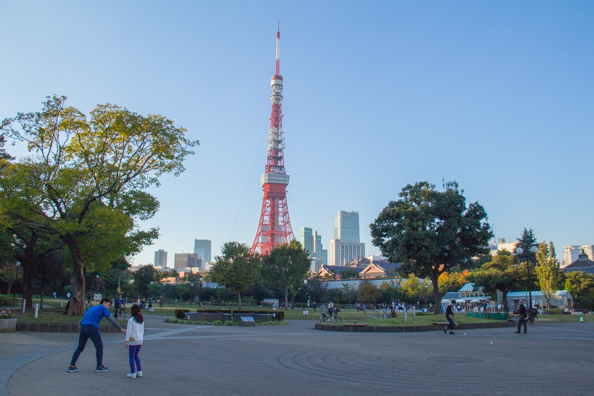 The tower is very close to Shiba Park, Japan’s oldest public park. It was the first to be officially designated as a park in 1873 just five years after the beginning of the modernisation of Japan. When the Meiji Emperor was restored to supreme power in 1867 a programme was started to create public parks throughout Japan. These were often fashioned out of the grounds of temples and shrines which, at that time, were the only green spaces. Shiba Park is crescent-shaped as it was fashioned out of the grounds of the Zöjöji Temple. This temple is both ancient and modern. 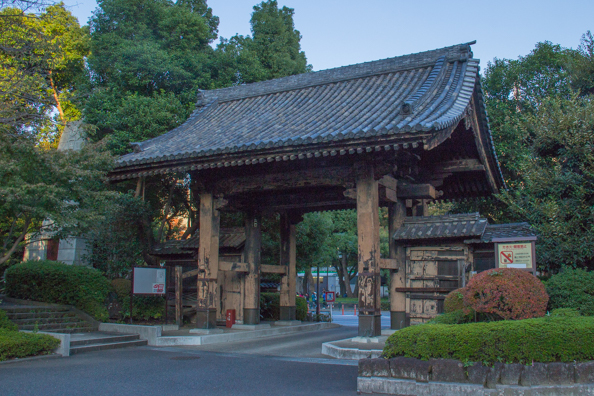 The two-storey wooden main gate, Sangedatsumon, was built in 1622 and is the oldest remaining wooden structure in Tokyo. This temple was founded in 1393 as a seminary for Jodo-shu also known as Jōdo Buddhism. It is a branch of Pure Land Buddhism derived from the teachings of a Japanese monk. At one time the temple comprised a huge complex including a large cathedral, forty-eight smaller attached temples and about one-hundred-and fifty schools. But during an anti-Buddhist movement some of these buildings were destroyed and others were burned down during the air raids of World War II. The cathedral and other structures were subsequently rebuilt. Zöjöji is still the main temple and seminary of Jodo-shu. It is also very popular with the general public as a place to worship and as a hub of religious and cultural activities. The exteriors of the buildings retain their traditional style but the interiors are refreshingly light and modern. During my stay in Japan I also used a pre-paid IC card included in our package. It works like an Oyster Card as money is taken off every time you enter or leave a station. But unlike the Oyster card any money left on the card can be spent in either a 7 Eleven or a Family Mart. These convenience stores are open twenty-four hours a day seven days a week. These stores are a real boon for the traveller on a shoe-string. They offer a wide variety of food at very reasonable prices. They also stock just about every item you might need – and it is fun trying to work out from the pictures exactly what each product is. They are everywhere and a convenient source of clean toilets. The 7 Elevens also have ATMs. This card can be used on the subway and there were several interesting places reachable from Minato on the subway. 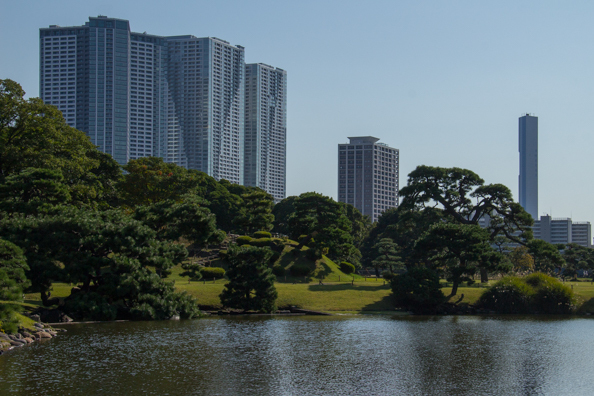 Hama Rikyu Garden was a famous Imperial garden during the Edo Period. It was given to the City of Tokyo in 1945 and the following year it was opened to the public. This beautifully landscaped garden includes several ponds and a tea house. The garden stretches along the bank of the Samuda River. After strolling through the gardens I took a waterbus (not included in the JR Rail Pass) from there to another famous site in Tokyo. Sensoji Temple, also known as Asakusa Kannon Temple. This Buddhist temple is one of Tokyo’s most popular and colourful temples. The temple is dedicated to Kannon, the goddess of mercy. It was founded, according to legend, after two brothers found a statue of this goddess floating in the Samuda River. They put the statue back into the river but it kept returning so finally, in 645, a temple was built dedicated to the goddess. It is Tokyo’s oldest temple and has an outer gate and an inner gate linked by a shopping street. The buildings are relatively modern as many of the original buildings were destroyed during the Second World War. 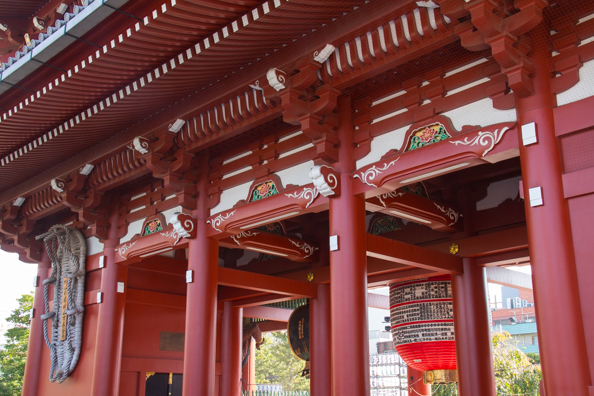 The temple shares its grounds with the Asakusa Shrine and both operate in harmony with each other. It was a good opportunity to compare the architecture of both institutions. My final visit of the day, journeying but both subway and the local railway, was the Meiji Shrine. This large Shinto Shrine was built in 1920 and is dedicated to the Meiji Emperor and his wife, Empress Shoken. Emperor Meiji brought an end to the feudal system in Japan and modernised his country. The shrine is set in a large park and has become Japan’s most famous shrine. One can understand why as you wander along tree lined avenues towards the main buildings. After four days in Tokyo I travelled to Matsumoto was my next destination. 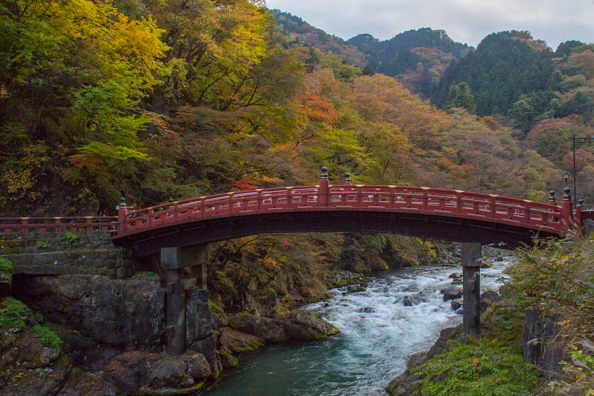 The town is an interesting mixture of ancient and modern and includes the Shinto Jorinji shrine. Its bright red gate, the oldest wooden gate in Matsumoto draws you into the complex which includes a pretty shrine and a lovely garden. This shrine is sited in a complex that includes a temple. The complex is notable because its wooden gate is the oldest gate in Matsumoto. Nawate-dori, also known as frog street is famous for its traditional shops filled with frog-themed products. This street was once the border between the commoner houses and Samurai residences. Running parallel to this street, on the other side of the Metoba-gawa River Nachamachi-dori St is lined with restored Samurai merchant houses. 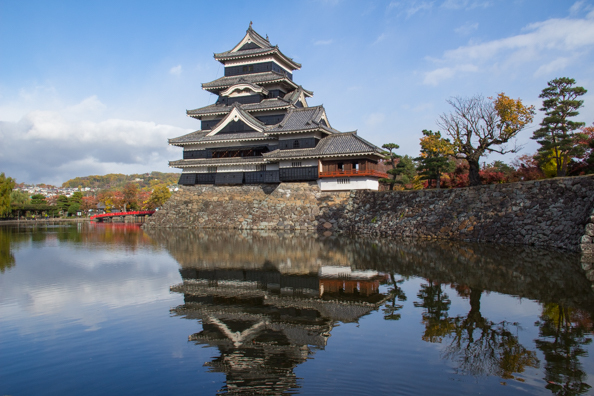 Matsumoto Castle is the most important attraction in this town. It is one of only four original castles remaining in Japan. It is a “hirajiro” castle becaues it was built on a plain rather than on a hill or a mountain. As its exterior is mostly black it is also is also known as the Black Crow. The all-wooden interior presents some challenges with its steep, narrow staircases designed to obstruct invaders. It is worth climbing to the sixth floor for the views of the gardens and the moat below. As I walked back to my hotel along Isemachi Street the giant karakuri clock was striking the hour. The large modern globe, representing a Matsumoto-temari opens and figures of young girls playing with temari (hand-made balls) revolve accompanied by music. 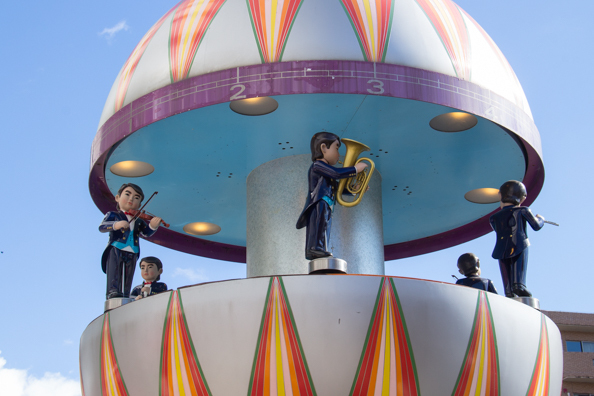 The globe closes and then opens again to reveal mechanical boys playing musical instruments. While I was in Matsumoto I took a local train out of the town to the Daio Wasabi Farm. I had no idea what a wasabi was but my education was complete after I had wandered through the beautiful grounds circling the fields planted with wasabi. Wasabi can be used to flavour everything it seems. I was happy to try the crisps but drew the line at wasabi-flavoured ice cream. 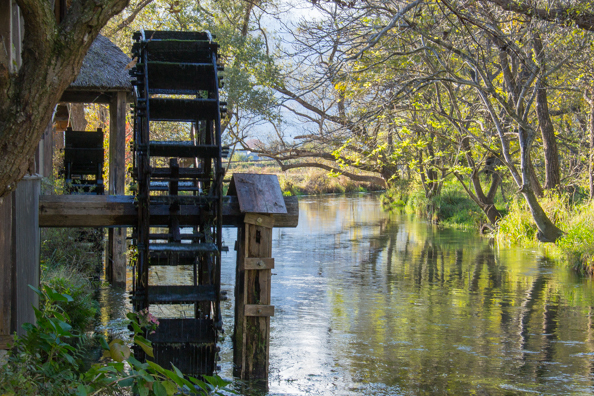 The watermills that were once essential to the production of wasabi still revolve along the river bank next to the farm. Three days later I was back on the train and heading for a short stay in Nagoya. Nagoya is the one of the largest towns in Japan and pre-dominantly industrial. It was once a beautiful wooden town but following its destruction during World War II it was rebuilt. It owes a lot of its prosperity as it is the home of Toyota, the largest company in Japan. I took a taxi to the Toyota Museum expecting just to see lots of old cars. I was wrong. The Museum has two pavilions, the Weaving Pavilion and the Automobile Museum. Toyota originally made spinning and weaving machines before moving on to the manufacture of cars. The two pavilions trace the history of the company. 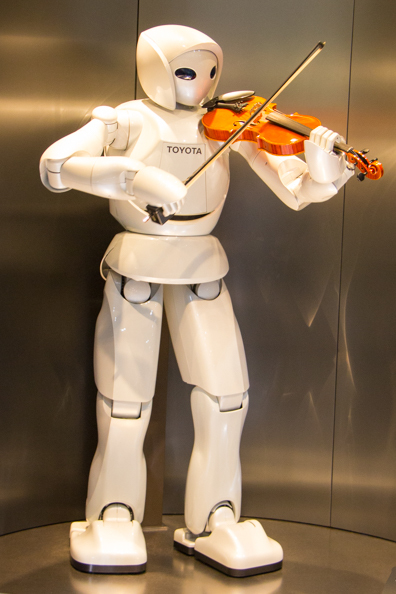 Robots were also on the agenda and we watched a robot playing the violin. After the museum we walked through Noritake Garden, the site of the Noritake Museum displaying intricate ceramic pieces made by the company of the same name. On my second day in Nagoya I took the train to Inuyama (which literally means “dog mountain”). Inuyama is famous for its small but beautiful castle which is one of Japan’s oldest wooden castles and still in its original state. After exploring this castle, I moved on to the Meiji Mura outdoor museum. This museum is set in a large park and features buildings from different eras and different places. It includes the impressive Saint John’s Anglican church. 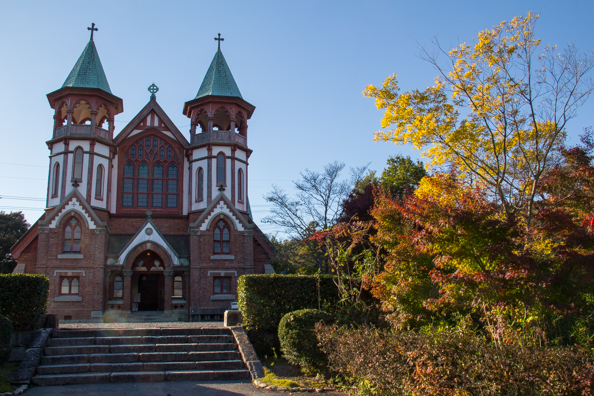 This church was built in 1907 and originally sited in Kyoto. I took a direct bus (not covered by JR Rail Pass) back to Nagoya for my last night in that city. I had already experienced a lot on my journey through Japan. There was a lot more to come in the next part of my journey from Kyoto to Shinjuku in Tokyo. This journey will be featured in my next blog post. Beautifully portrayed. The images are awesome and we all know Japan is known for its imperial palaces, mountains, temples & trains. Hope you had a nice memorable time. Thank you for your comments. Yes I had a wonderful time and would recommend taking the train to explore Japan as there is so much to see.